Just yesterday I watched an interview with Nneka and Moses Isaac the minds behind Goge Africa, the long running travelogue. Over the years the program has expanded in popularity, concept and reach. I've always been impressed by this husband and wife team. They have been promoting African culture and tourism since 1999. The couple present, produce and direct the award winning culture and tourism TV show – Goge Africa. They were interviewed alongside their one year old son, who is the couples first child since their marriage in 1998. Waiting for the fruit of the womb is one challenge that can really put a strain on marriage. Many times couples are patient but after one or two years without an issue pressure starts mounting left right and centre. Some men try their luck elsewhere, some in-laws will even arrange another girl for the man and when that fails they are encouraged to go to all sorts of places for a solution. So couples, especially women, are left traumatised by the constant pressure. Nneka said her husband was her rock. She confessed that some times she would be so low especially at the onset of another period but her husband would tell her not to worry. He said his faith was in the fact that God loved all his children equally and one day it would be his turn. Nneka mentioned that one thing that really helped her was forging friendships with older women. "Women who had seen life! They helped me focus". She said her faith in God helped stabilize her and gave her hope. She added that since they didn't have any children to get in the way, they made sure they enjoyed each Valentines day to the fullest. 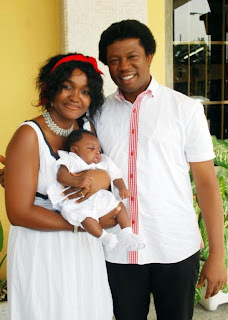 On the question of how they managed to maintain such a happy marriage Nneka Moses said "I never focus on his weaknesses but on his strengths and all the good things he does". This couple waited 14 years and although its not that easy, but there shouldn't be any limit to how long you can wait. One begs to ask, why am I getting married? A lot of people get married 4 the wrongest reasons. When one marries the person he truly loves and cares about, children or the lack there of, should not be the main issue. Children would be like the icing on the cake. Thank God, these days the option of IVF and adoption is very open and available. The only person that gives children is God Almighty, and faith has a major role to play while waiting.